Eyebrow ring jewellery can include ball closure rings of many sorts, as well as circular barbells that are horseshoe shaped. Eyebrow rings are selected from a choice of different sizes but will vary from person to person, so you will need to know the size of your eyebrow piercing before choosing your eyebrow jewellery. Eyebrow ring jewellery needs to be measured in gauge (thickness) of the ring and also the internal diameter of the ring. Ball closure ring eyebrow jewellery featuresÂ a captiveÂ ball or accessory that secures the eyebrow ring by clipping into it. Eyebrow rings can be found in many different materials and designs to cater for all tastes, whether you are looking for fantastic value in surgical steel eyebrow rings, or for a sleek and stylish look with blackline eyebrow ring jewellery, we have something for everyone! Circular barbell eyebrow rings are horseshoe shaped and feature two removable threaded balls or accessories that screw onto each end of the circular barbell eyebrow ring. You can remove the threaded accessories from the eyebrow ring to customize your look in seconds, without the need to remove the eyebrow ring. This is a great way to change your look in an instant, and is also quick and easy to do! This entry was posted in Acrylic Body Jewellery, Ball Closure Rings, Blackline Body Jewellery, Circular Barbells, Eyebrow Piercings, Glow Body Jewellery, Gold Body Jewellery, Surgical Steel Body Jewellery, Titanium Body Jewellery, Zircon Gold Body Jewellery and tagged Eyebrow Jewellery, Eyebrow Piercings, Eyebrow Ring Jewellery, Eyebrow Rings, Eyebrow Studs on July 6, 2010 by Piercing Guru. Belly piercings are also known as navel piercings or belly button piercings. Belly piercings are usually pierced at a standard gauge (thickness) of 1.6mm. Belly piercing jewellery will vary in length or internal diameter, usually between 6mm and 12mm depending on the length of your belly piercing. When choosing jewellery for your belly piercing, you must ensure to measure your belly piercing and choose the correct length of belly bar, or the correct internal diameter for your belly ring. Belly piercing rings feature a 1.6mm gauge ring that is fastened with a clip-in accessory or charm, which sits through your belly piercing. Belly piercing rings are available in a range of stylish designs with classic jewelled charms or funky designs including skulls and stars. 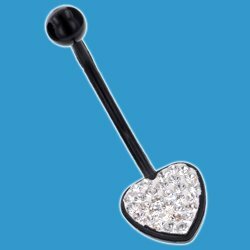 Blackline belly piercing jewellery is really popular and stylish, making any piercing stand out with a sleek, glossy blackline finish. Blackline belly jewellery includes blackline bananabells in many different designs with jewelled belly bars, circobell belly piercing bars and glitter belly piercing bars amongst many others. Customize your belly peircing in an instant with our fabulous selection of belly piercing charms, navel orbitals, navel rounders and bananabell chains. These belly piercing accessories are great for updating your look within seconds, without the need to change your entire belly piercing bar! This entry was posted in Acrylic Body Jewellery, Ball Closure Rings, Barbells, Belly (Navel) Piercings, Blackline Body Jewellery, Glow Body Jewellery, Gold Body Jewellery, Navel Bananabells, Surgical Steel Body Jewellery, Titanium Body Jewellery, Zircon Gold Body Jewellery and tagged Belly (Navel) Piercings, Belly Bars, Belly Button Piercing, Belly Pierced, Belly Piercing, Belly Piercing Jewellery, Belly Rings on July 2, 2010 by Piercing Guru. Belly piercingÂ jewels are glitzy and glamorous, perfect for dressing up your belly piercing and looking like a star! A belly piercing jewel can be worn for all occasions, throughout the year to brighten up your look in the sunshine, or to add a touch of glamour to your Christmas outfit; the ultimate festive accessory! Belly piercing jewels can be found in a variety of ranges fromÂ the highlyÂ exclusive swarovski jewels to beautifully set cubic zirconia jewels in a stunning array of colours, shapes and designs. 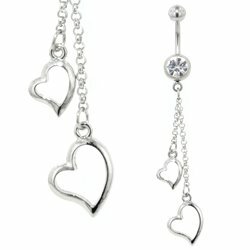 We even have a wonderous range of cluster set belly piercing jewels that exude true star quality! Surgical steel belly piercing jewels include the jewelled navel bananabells that come in a range of different colours to suit your style. 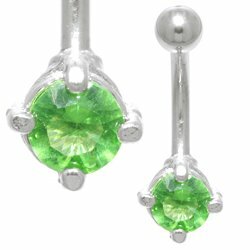 Surgical steel belly piercing jewels can be purchased with one single jewelled belly jewel, or double belly piercing jewels, amongst other designs including the Rivoli belly jewels, smooth belly peircing jewels, claw-set belly piercing jewels and cluster belly jewels. 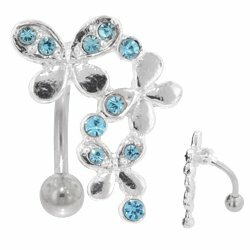 The Titanium belly piercing jewel range includes a gorgeous selection of belly peircing jewels with different coloured titanium stems, including purple bananabells, green, dark blue, light blue and the standard ti-glow bananabell stems. The titanium belly piercing jewel colour range also boasts these beautiful colour combinations of crystal ab belly piercingÂ jewel, rainbow belly piercing jewel, and vitrail light belly piercing jewel. Check out the beautiful cluster belly jewels for ultimate dazzle! These rich and prestigious Swarovski crystal belly jewels are the ultimate belly piercing accessories, with stunningly set swarovski jewels to dress up your belly piercing in style. With a vast selection of different swarovski belly piercingÂ jewel colours, shapes, styles and designs for all tastes and occasions. Treat your special lady to one of the most wonderful gifts a lady could get for her belly piercing! Perfect for birthday gifts, Christmas gifts and even Valentines Day, for a true spark of romance. This entry was posted in Belly (Navel) Piercings, Blackline Body Jewellery, Gold Body Jewellery, Navel Bananabells, Stone Body Jewellery, Surgical Steel Body Jewellery, Titanium Body Jewellery, Zircon Gold Body Jewellery and tagged Belly Jewels, Belly Piercing Jewel, Belly Piercing Jewelled, Belly Piercing Jewels on June 29, 2010 by Piercing Guru. Body piercing threaded accessories are fantastic for customizing your body piercing jewellery within seconds, for a completely new look! Easy to fit, these funky threaded accessories can be threaded onto your body jewellery, including threaded barbells, labret studs, body spirals, bananabells and circular barbells. Body piercing threaded accessories come in many different shapes, colours and designs to suit your mood. Body piercing threaded accessories include these funky steel threadedÂ accessories, blackline threaded accessories, titanium threaded accessories, gemstone threaded accessories, bioplast threaded accessories, zircon gold threaded accessories, acrylic threaded accessories and UV threaded accessories. 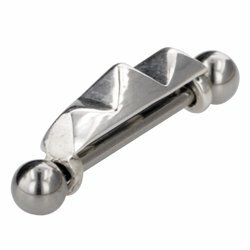 These cute Surgical Steel body piercing accessories include a really unique range of steelÂ threaded dice, steel threaded stars, steel threaded skulls, steel threaded hearts, steel threaded razor blade, steel threaded cherries and glamorous steel threaded jewelled balls. Check out the full range of surgical steel threaded accessories to transform your body piercings in an instant! These non-metal acrylic body piercing accessories are bright and funky! With a choice of cute patterns and designs, acrylic threaded accessories are perfect for gifts and stocking fillers this Christmas! These blackline body piercing accessories include a gorgeous range of stylish blackline threaded balls, blackline threaded cones and spikes, blackline threaded jewelled balls, blackline internally threaded accessories, blackline threaded fluoroballs,Â blackline threaded glow balls, blackline threaded circo balls and much more! This entry was posted in Acrylic Body Jewellery, Amber Body Jewellery, Balls and Accessories, Belly (Navel) Piercings, Blackline Body Jewellery, Ear Piercings, Eyebrow Piercings, Microdermals, Piercing Accessories, Surgical Steel Body Jewellery, Titanium Body Jewellery, Tongue Piercings, Zircon Gold Body Jewellery and tagged Body Piercing Threaded Accessories, Body Piercing Threaded Accessory, Piercing Accessories, Piercing Threaded Balls, Piercing Threaded Stars, Threaded Cones on June 24, 2010 by Piercing Guru. Ear stretching jewellery comes in many different styles. Choose ear stretching jewellery from a fantastic choice of different materials that all come with their own advantages! We have a beautiful variety of ear stretching jewellery in surgical steel, blackline, titanium, zircon gold, water buffalo horn, bone, wood, coral, PMMA acrylic, Silicone, Glow in the Dark, Amber, Ultra Violet and Glass. Stretching your piercing can be a bright, funky and stylish journey of fabulous ear stretching jewellery with such an extravagant range to choose from! Some of the most popular glass stretching jewellery pieces include these fabulous glass spirals, twists and claws. With a stunningly vibrant and unique combination of colours and patterns to choose from, glass ear stretching jewellery makes the perfect gift for all occasions, whether it’s a treat for your special someone or just yourself! Wood is a fantastic material to choose for healed stretched ear piercings, but wood must not be used for a new stretch as the porous material can absorb bodily fluids and harbour bacteria; not a great combination when healing a fresh ear stretch! Wooden stretching jewellery is extraordinarily rich in variety, from different types of woods and combinations, with hand-painted designs, we’re sure you’ll find the perfect match! Check out the range of wooden ear spirals and claws, wooden tapers, and wooden flesh plugs and tunnels. Surgical steel ear stretching jewellery boasts the largest range of designs, from stretching flesh tubes, stretching plugs,Â stretching tunnels, stretching eyelets, stretching spirals, stretching claws, stretching twists, stretchingÂ insertion pins, stretching tapers, stretching kits and many more. Fantastic value and incredibly diverse choice of designs to choose from, your stretched ear piercing can be bright and snazzy all year round! This entry was posted in Acrylic Body Jewellery, Amber Body Jewellery, Blackline Body Jewellery, Buffalo Body Jewellery, Ear Piercings, Glass Body Jewellery, Glow Body Jewellery, Gold Body Jewellery, Lava Body Jewellery, Organic Body Jewellery, Stone Body Jewellery, Stretched Piercings, Stretching Jewellery, Surgical Steel Body Jewellery, Titanium Body Jewellery, UV Body Jewellery, Wood Body Jewellery, Zircon Gold Body Jewellery and tagged Ear Stretched, Ear Stretching, Ear Stretching Jewellery, Stretched Piercing, Stretching Jewellery on February 18, 2010 by Piercing Guru. Flesh Tunnels are specifically designed for stretched ear piercings. 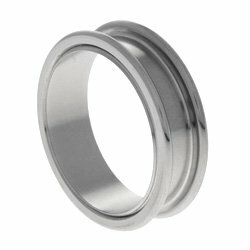 Flesh tunnels are usuallyÂ designed in two pieces, with one removable lip that screws into or onto one end of the flesh tunnel for easy and hassle-free fitting. The flesh tunnel sits securely in your ear piercing withoutÂ risk of fallingÂ out until you unscrew theÂ removable end.Â There are some variations, however, the silicone flesh tunnels are designedÂ in one piece that can be flexed and folded; the flexible silicone material allows easy insertion of the flesh tunnel into your ear without having to take it apart. Flesh tunnels come in such an extravagant range of beautiful designs, from the funky and jazzy styles to the more subtle, bold and sleek pieces for minimalistic fashion. These fantastic silicone flesh tunnels are available in a vibrant range of colours to suit your mood, perfect for brightening up your look in an instant. Spice up the summer months with these spectacular red silicone flesh tunnels, blue silicone flesh tunnels, green silicone flesh tunnels, orange silicone flesh tunnels, yellow silicone flesh tunnels, pink silicone flesh tunnels, white silicone flesh tunnels and black silicone flesh tunnels. 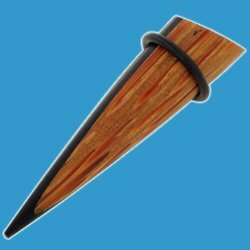 We have a great selection of natural, organic flesh tunnels in our range including wooden flesh tunnels, buffalo flesh tunnels, bone flesh tunnels, coral flesh tunnels and fossilized bamboo tunnels. The fabulous wooden flesh tunnel range includes a very unique range of different types of wood that have been beautifully crafted to perfection. With natural patterns, grains and combinations of shades, these wooden flesh tunnels include inlaid flesh tunnels that will guarantee to impress. The buffalo flesh tunnel rangeÂ features this stunning lotus flesh tunnel for intricate beauty. For fantastic value and some extravagant sizes, the surgical steel flesh tunnel range includes some very unique designs but with a stunning, classical look. Our surgical steel flesh tunnels include large gauges up to 30mm in size. Surgical steel flesh tunnels include internally threaded flesh tunnels and even some glamorous jewelled flesh tunnels for a touch of glamour. The largest gauge of flesh tunnels in our extensive range includes sizes all the way up to 50mm! 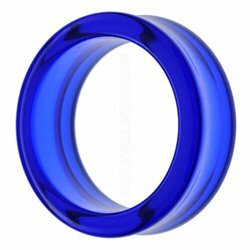 These UV acrylic flesh tunnels are available in larger sizes up to 50mm and in a fabulous range of colours to choose from, including the UV mega tunnels in green, red, blue, black, clear. This entry was posted in Acrylic Body Jewellery, Blackline Body Jewellery, Buffalo Body Jewellery, Ear Piercings, Glass Body Jewellery, Glow Body Jewellery, Organic Body Jewellery, Stretched Piercings, Stretching Jewellery, Surgical Steel Body Jewellery, Titanium Body Jewellery, UV Body Jewellery, Wood Body Jewellery, Zircon Gold Body Jewellery and tagged Ear Tunnels, Flesh Tunnel, Flesh Tunnels, Stretching Tunnels on February 9, 2010 by Piercing Guru. Eyebrow barbells come in many different varieties, with a selection of materials and designs to choose from, your eyebrow piercing can be adorned with the most stylish and unique eyebrow jewellery in town! View the extensive range of eyebrow barbells including flexible bioplast eyebrow barbell, eyebrow barbell retainers, surgical steel eyebrow barbells, titanium eyebrow barbells, glow in the dark eyebrow barbells and blackline eyebrow barbells. The length of theÂ eyebrow barbell is measured in correspondence with the measurement between the two exit holes of your eyebrow piercing. 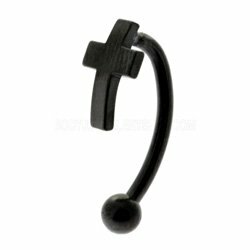 Curved eyebrow barbells are also known as eyebrow bananabells and have a slightly curved stem that sits through yourÂ eyebrow piercing comfortably. 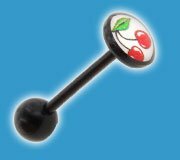 Some of our most popular curved eyebrow barbells include the blackline cross eyebrow barbell, the swallow motif curved eyebrow barbell, the glow in the dark eyebrow barbell and the funky bioplast dollar sign eyebrow barbell. This entry was posted in Acrylic Body Jewellery, Barbells, Blackline Body Jewellery, Eyebrow Piercings, Glow Body Jewellery, Gold Body Jewellery, Surgical Steel Body Jewellery, Titanium Body Jewellery, UV Body Jewellery, Zircon Gold Body Jewellery and tagged Eyebrow Bananabell, Eyebrow Bar, Eyebrow Barbells, Eyebrow Jewellery, Eyebrow Piercing, Eyebrow Retainer, Eyebrow Stud, Eyebrow Studs on January 22, 2010 by Piercing Guru. Tongue rings and tongue barbells are specifically designed for tongue piercings.Â Choosing your tongue ring has never been easier with such an extravagant range of different designs to choose from! Tongue rings come in many different materials, colours and with different types of gorgeous threaded accessories on the top of the tongue jewellery. Tongue rings include a fabulous range of different tongue jewellery including tongue barbells, tongue ticklers, tongue retainers, tongue piercing accessories, tongue studs, flat tongue studs, picture tongue bars and even these funky tongue ring bonus packs. 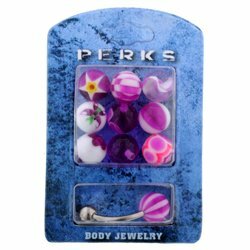 These funky tongue piercing bonus packs include the girly and cute pink tongue barbell bonus pack with a selection of pink threaded balls and accessories to customize your tongue ring! We also have the Jewelled Tongue Bar Bonus Pack, Red Skulls Tongue Rings,Â Pentagram Star Tongue Barbell & Threaded Accessories Set, Black Jewelled Star Tongue Barbell & Threaded Accessories Set, Striped TongueÂ Barbell & Threaded Balls Bonus Pack, Black Skull Tongue Barbell & Threaded Accessories, Rasta Tongue Ring Set and the SilverÂ Star Barbell & Threaded Accessories Set. These funky tongue rings feature picture discs at the top of the tongue bar, with really cute and colourful designs such as the smiley picture tongue ring, blue kitten picture tongue ring, white kitten picture tongue ring, kanji picture tongue bar, heart picture tongue bar and many more! This entry was posted in Acrylic Body Jewellery, Barbells, Blackline Body Jewellery, Glow Body Jewellery, Gold Body Jewellery, Surgical Steel Body Jewellery, Titanium Body Jewellery, Tongue Piercings, Zircon Gold Body Jewellery and tagged Tongue Bar, Tongue Barbells, Tongue Jewellery, Tongue Piercing Ring, Tongue Piercings, Tongue Rings, Tongue Stud, Tongue Studs on December 17, 2009 by Piercing Guru. are very popular and are located just below the lip piercing. A labret piercing is most commonly in the centre of the chin area, however, can also be pierced off-centre along the lower lip line. You can even have multiple labret piercings. A standard labret piercing is usually pierced with a needle gauge of either 1.2mm or 1.6mm (14 gauge), however, you can stretch your labret piercing to a larger gauge thickness if you wish. 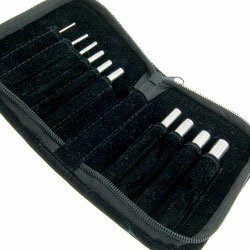 We have larger gauge labret studs for stretched labret piercings at a gauge of 2mm labret or 2.4mm labret in surgical steel. Accessorizing your stretched labret piercing will be limited, as larger gauges will not have a big choice of threaded accessories to choose from. Micro labret piercings are pierced at a gauge of 1.2mm, the thinnest labret piercing size to choose from. Micro labret studs have a great selection of cute and micro sized labret jewellery for a more subtle look, making your jewellery small and dainty. Micro labret piercing studs include a bright and vibrant range of funky designs in the UV micro labret stud section with some very unique designs to choose from. This entry was posted in Acrylic Body Jewellery, Blackline Body Jewellery, Gold Body Jewellery, Labret Piercings, Labret Studs, Surgical Steel Body Jewellery, Titanium Body Jewellery, Zircon Gold Body Jewellery and tagged Labret Jewellery, Labret Piercing, Labret Piercing Jewellery, Labret Piercing Stud, Labret Piercing Studs, Labret Piercings, Labret Stud on December 16, 2009 by Piercing Guru.